What to see in Hanoi Vietnam travel package? The perfect combination of a charming, old city - Hanoi, beautiful countrysides - Tamcoc and Halong bay discovery and the stunning scenery of Catba island. 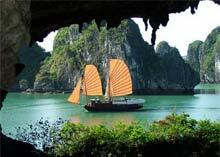 Halong Bay tour is the top of all Vietnam holiday packages. Gurantee wonderful time for your lifetime travel. Limited offers. pick up at the airport. Transfer to your hotel. If time is possible, enjoy a cycling tour around the French and old quarters and waterpuppet show. Take a morning visit to Ho Chi Minh Mausoleum(close on Monday and Friday), his House on Stilts, the One Pillar Pagoda, the Temple of Literature . Drive to Halong city for Overnight. Cruise Halong Bay through many naturally shaped limestone islands which amazingly come up from emerald water. Visit Thien Cung, one of the most beautiful cave in Halong Bay. Have lunch on your Halong bay cruise before getting to Catba island. Discover catba national park with 2 hour trekking to Ngu Lam mountain. Overnight in Catba island. Take highspeed boat to Hai Phong city and drive through beautiful countryside of the Red river to Ninh Binh. Overnight in Ninh Binh. Discover Tam Coc by joining a bamboo sampan rowed by the locals to explore beautiful nature beauty along peaceful river surrounded by amazingly shaped limestone mountains and rice fields. 12:30 Have lunch. Visit Bich Dong pagoda with three levels from the bottom to the top of the mountain. Before driving back to Hanoi, see Hoa Luu - the ancient captial of Vietnam. Pick up at your hotel. Transfer to airport. Your Hanoi Vietnam travel ends.